Rest assured you will be in safe and experienced hands. Once you have completed the exam and are a candidate for care, you can feel safe knowing that underlying medical issues have been addressed and potential complications have not been overlooked. Also, this care is safe for infants to seniors. All ages can benefit from upper cervical care. I have to go forever? At The Upper Cervical Clinic we strive to be the most efficient and effective as possible while getting the results you are looking for. This means we are looking for lasting results to save you time and money. If you are a candidate for care, you will receive a specific care plan and then reassess your new health goals at the end of that plan. Most patients decide they love the results of the first care plan and make Upper Cervical Care a regular part of their healthy lifestyle. The adjustment is very quick. Some people feel it’s a little less than comfortable, but is tolerable. Most patients are surprised at how conservative the adjustment is compared with their idea of a typical chiropractic visit. Once the adjustment is complete, you will spend a short amount of time in our rejuvenation room, allowing your body to adapt to its new alignment. The Doctors at The Upper Cervical Clinic are Board Certified on both National and State levels as a Chiropractic Physician (Doctor of Chiropractic) and licensed by the State of Oregon. You will not need a referral from another physician to have an exam or start care. The Doctors are trained to diagnose any condition you may be experiencing or make the proper referrals when necessary. 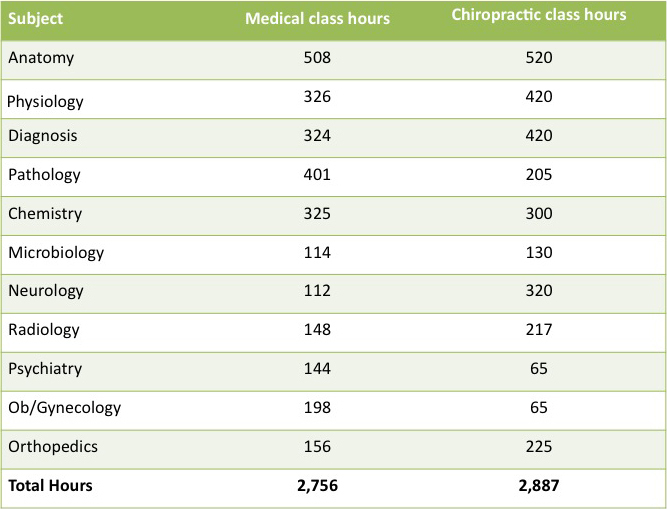 See the comparison chart below of educational requirements for both medical and chiropractic doctors. Upper Cervical Care is exactly what you have been searching for. This is a patient-specific correction of a slightly misaligned vertebra at the very top of your neck. It’s only given when nerve interference is present (not every visit). The adjustment is delivered by the gentle hands of our Doctors as a controlled and quick thrust to the upper neck. There is no rapid rotation or large sideways movements of the neck. The patient is positioned according to their specific misalignment with their knees bent and upper body resting on the adjusting table. The adjustment is most likely very different from what one may think of a typical chiropractic adjustment. Every part of your care plan is based on the most current anatomy and physiology information about the human body. We use thermographic technology applied at the neck level to be the most specific and efficient for our patients. This is the same technology used in the latest woman’s health clinics around the world as a tool to detect pathologies. Many case studies and research have been published on Upper Cervical Care, you only have to search the web or ask our Doctors, they would love to share! This is not faith-based healing. A consultation and thorough examination will be performed in order to determine if you are a candidate for Upper Cervical Care. It’s estimated 5% of those examined are not a good fit for this care due to anatomical anomalies, previous complicating surgeries or lack of honest commitment to a healthier life.